Year 2013 was indeed good year for equities. Despites of all negatives & weak economy indicators market gave good return to investors. Soon we will be entering in 2014. New Year will be year with lot of hope. Biggest planned event in 2014 is general election. Result of election can either turn the market or burn the market. Investor need to be slightly cautious in selecting stocks. 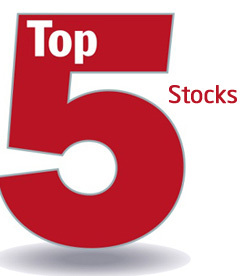 We are here with Top 5 Stocks that can give good return in 2014. Infosys is one of the top IT Company in India. Infosys is right now well position to regain market share. In 2013 Infosys gave good return to investors. Rejoining for Mr.Naraynmurthi has boost confidence level of investors. We see this stock giving good return in 2014. Invest today with target price of Rs.4,150. TCS providing IT services & involved in outsourcing business from India. TCS is well established is known for services. TCS delivered robust financial & operational performance in last two years. We recommend buying this stock with target of Rs 2600. ITC is leading FMCG Company of India. ITC has shown strong growth in 2013. With strong pricing power we continue to see rise in stock price. We set target price of Rs.409 for ITC. Lupin drug maker is one of the highest revenue and earning company. It is a strong player on focused beneficial areas. We recommend buying this stock with target of 1,019 Rs. Larsen & Toubro (L&T), the largest engineering, construction & infrastructure company in India, more or less L&T is a direct beneficiary of the strong domestic infrastructure development and industrial capex boom. Despite challenges like stiff competition, the company has given a robust guidance of 15% growth in the future. A sound execution track record, a strong order book and a healthy performance of its subsidiaries reinforce our faith in L&T. We recommend buying this stock with target of Rs 1250. Hope we have great year ahead – Happy Investing & Happy 2014.